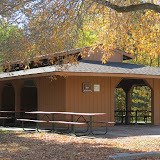 Meadowlark Shelter, located in Squaw Creek Park, is one of the larger open shelters available for reservations in the Linn County Park system. With adjacent parking lots that can accommodate 132+ vehicles, this shelter is popular for all kinds of family, corporate and social events. Special permits required for horses, erection of tents, inflatable play equipment, hog roasts, fireworks, carnival-type activities, etc. Please contact the Park Ranger for additional information at 377-5954. $50.00/day weekends & holidays; $35/day weekday. Meadowlark Shelter is a seasonal facility, available for reservations from 7:00 AM to 10:00 PM daily from April 15 thru October 15. This shelter facility is not available for reservation after October 15 and prior to April 15.